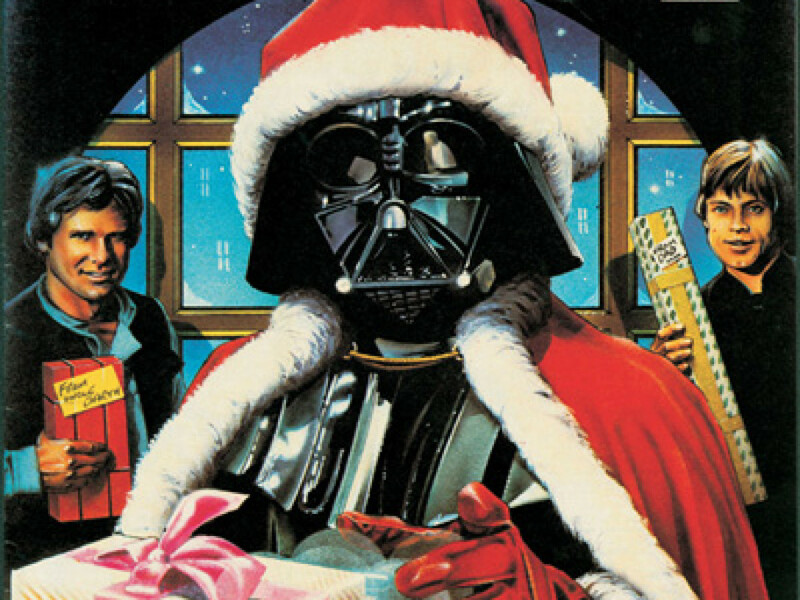 Don’t get caught in an Admiral Ackbar-like trap this holiday season; ensure you’re one step ahead of the droid army with this handy gift guide. 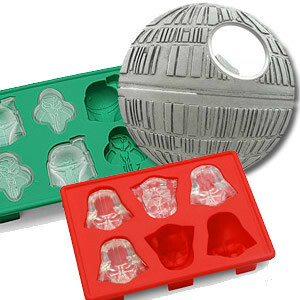 As I sit down to write this, it’s time to grab a drink…why not use the Diamond Select Death Star bottle opener. It’s fully armed and operational and ready to open your favorite beverage. Add some ice in the shape of Darth Vader or Boba Fett from the silicon ice cube trays from Kotobukiya (they’re great for chocolate treats, too). Available at Entertainment Earth and ThinkGeek. Her Universe continues to bring sci-fi to the female masses with an extension of licenses and lots more Star Wars products, including a great black-and-white pencil skirt featuring the Millennium Falcon, an Episode II poster tee shirt featuring classic artwork from Attack of the Clones, and an incredibly soft, tri-blend lounge hoodie with the word “Hope” and the Rebel Alliance logo. 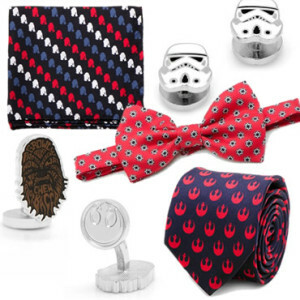 If you want something a little more formal then head to Cufflinks.com for their expanded collection of licensed Star Wars products including neck ties, bow ties, pocket squares, cuff links, tie bars, and money clips. 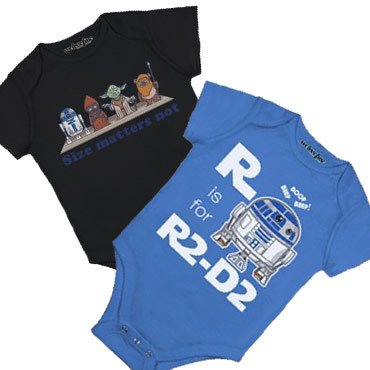 Plus, get 15% off all Star Wars products through 12/31 with coupon code sw15. 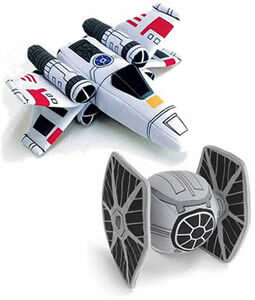 There’s no better way to introduce your young ones to the galaxy far, far away than with these great wacky deformed X-wing and TIE fighter plush vehicles from Comic Images, both measuring 7” long. These join the ranks of many other Star Wars “super deformed” plush toys available including creatures, other vehicles and characters. Funko continue their series of Pop Vinyl Bobbleheads, now on its 4th wave, featuring classic characters from the whole saga. This new wave brings Wicket, Jar Jar Binks, and Admiral Ackbar, amongst others. Angry Birds Star Wars is back and this time you can teleport your collectible characters directly into the game using the camera on your phone or tablet using the Telepod technology developed by Hasbro — which has seen over 1 million units sold already! 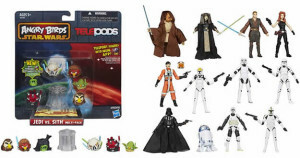 Hasbro continues its line of 3.75” action figures with Saga Legends and the Mission Series 2 packs which feature five points of articulation and a reduced price point, geared firmly at the children’s market. There are lots of characters to choose from, ensuring there’s something for everybody. 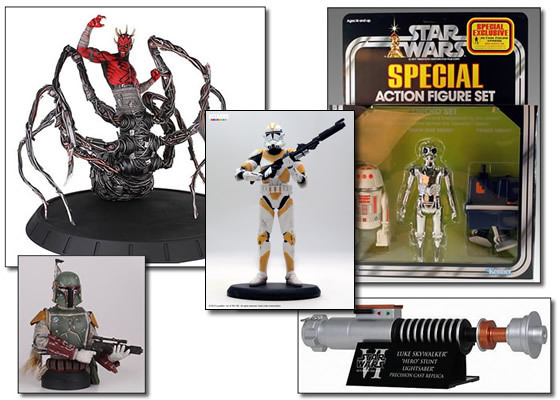 The older action figure toy collector is not forgotten either, with 3.75” figures featuring multiple points of articulation in the form of the Black Series. 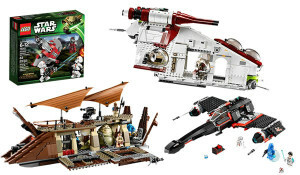 Figures include Anakin Skywalker, Biker Scout, Darth Vader, Pablo Jill, Luminara Unduli, and fan favorite winner Mara Jade. 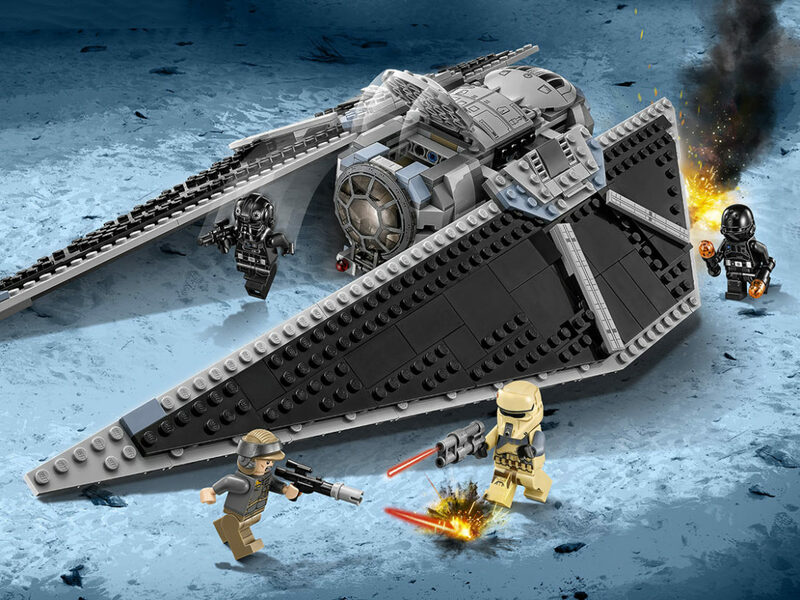 LEGO continues to build its Star Wars product line, which now includes the prequels, the original trilogy, the EU, and LEGO’s own Star Wars stories as played out in The Yoda Chronicles (also available on DVD). What will you choose to build…? The final broadcast season of Star Wars: The Clone Wars is available on Blu-ray and DVD. 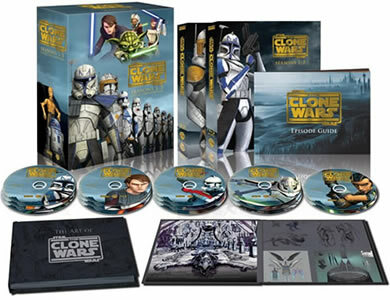 There’s also an amazing Collector’s Edition Blu-ray box set featuring every episode of The Clone Wars from Season One through to Season Five. Included is an art book with never-before-seen images from the show — a must buy for any serious fan of the show. 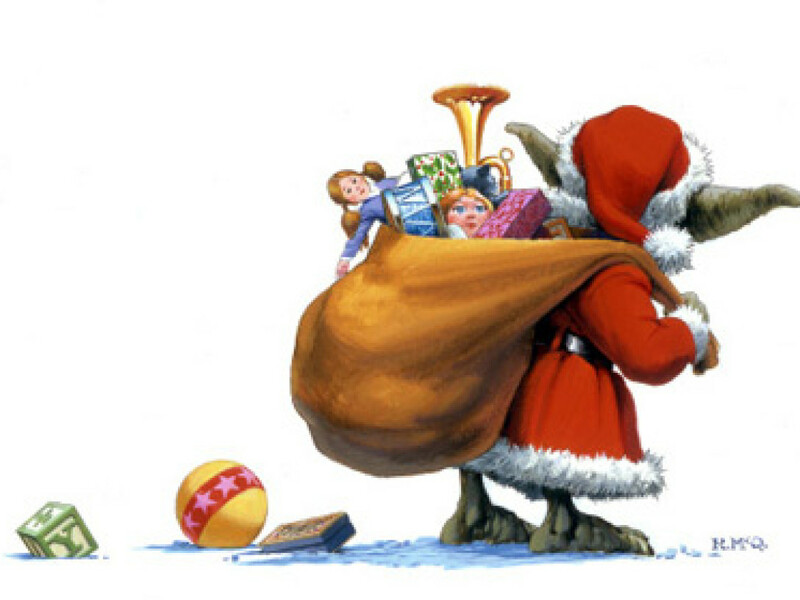 In 1981, George Lucas’ Star Wars movie script was adapted to meet the special demands and unique possibilities of radio, producing an enhanced, expanded version of the story, with many scenes not seen in the film, adding a significant amount of backstory and a much greater emphasis on character development. As a result, Star Wars: The Original Radio Drama, published by HighBridge Audio, became something that is familiar yet completely new — an exhilarating, deeply satisfying fable for the mind’s eye. Available again more than 30 years after originally airing on NPR, HighBridge is celebrating with the release of two limited edition MP3 Collector’s volumes of Star Wars: A New Hope — The Original Radio Drama, Light Side and Dark Side. The Light Side edition cover has been illustrated by Matt Busch whilst the Dark Side edition was illustrated by Randy Martinez. Both volumes also include an exclusive TOPPS Star Wars Illustrated: A New Hope card that corresponds to the package cover art. Topps’ Star Wars Illustrated: A New Hope collectible cards are also available now and take the classic radio drama and bring it to life using original artwork, for a new spin on a story that’s been told many times. New art runs throughout much of the release, including several insert sets. Look out for Panorama Sketch Cards, Film Cel Relics, and Sketchagraphs. 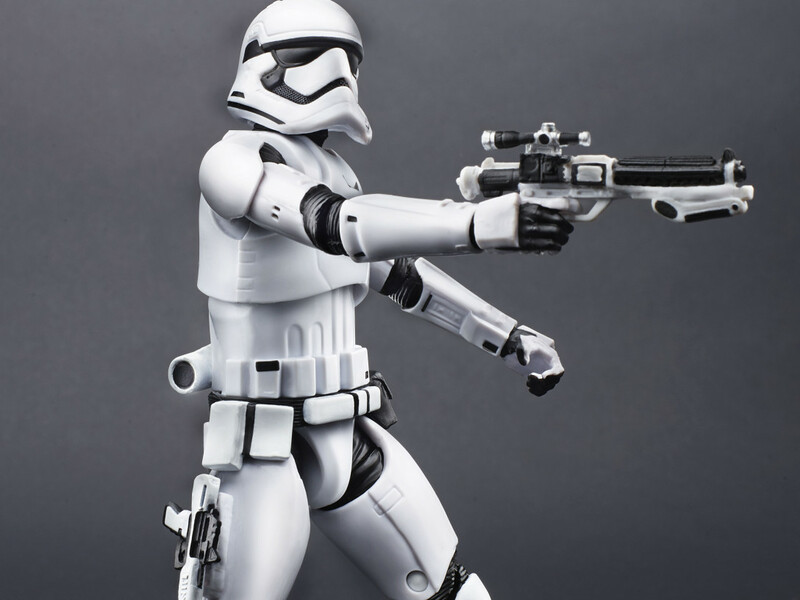 This year Hasbro brought us the definitive and most detailed line of action figures yet in the form of The Black Series in an all-new 6” scale, a first for Star Wars. Working with Gentle Giant Ltd. to ensure sculpts could be the best they could be, Hasbro has blown fans away with an unprecedented level of accuracy and detail. Available now are Greedo, Han Solo, Boba Fett, and Slave Leia from Jabba’s Palace. eFX has released the Luke Skywalker Precision Cast “Hero” Lightsaber Replica from Return of the Jedi. This is a replica stunt version of the hilt used in the film, cast in resin, that’s been made to look just like the original prop although it’s much lighter and easier to wield whilst filming. Attakus has expanded its range of clone troopers in its Elite Collection (1:10) scale line to include the 212th Attack Battalion Utapau clone trooper and the classic version of the Revenge of the Sith clone trooper. Available now, these will be sure to rank highly as part of any collection. 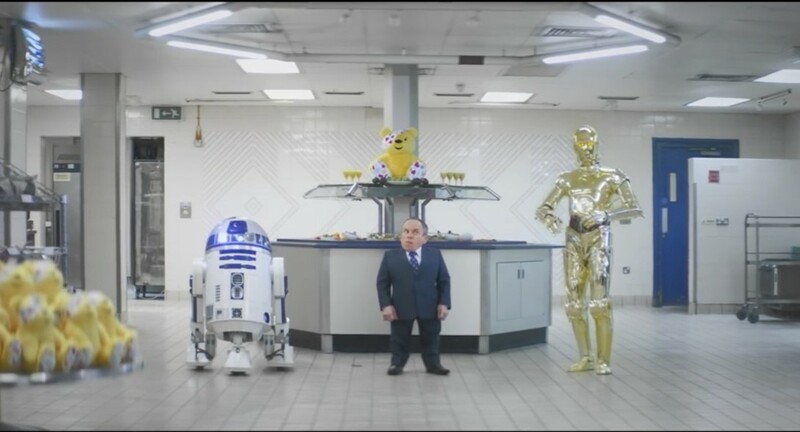 Gentle Giant continues its line of Classic Kenner Jumbo figures (12” scale) with an exclusive three pack available at Action Figure Express that recreates the classic Droids three packs from the vintage era and includes the Death Star Droid, R5-D4, and Power Droid. The Boba Fett Mini Bust was one of the first to be released by Gentle Giant and sold out long ago but this year it decided to revisit the character in “Deluxe” form to honor this iconic character in a way he truly deserves. Crafted by the master artisans at Gentle Giant Ltd., this bust redefines the term “Deluxe” and comes packaged in a gorgeous tin emblazoned with the insignia of the feared Mandalorian Mercenaries, the Deluxe Boba Fett Mini Bust features multiple interchangeable arms, allowing collectors a wide range of dynamic poses. This limited edition bust was first available at San Diego Comic Con earlier in the year and is available in limited quantities now. Limited to just 400 pieces the awesome Darth Maul Spider Statue from Gentle Giant is one of the largest statues they’ve ever made and was created to celebrate the return of Darth Maul in The Clone Wars. Boasting an unmatched level of detail, this limited edition hand-painted statue is a must-have for any serious Star Wars fan or collector. Hand-crafted using only the highest quality polystone, and individually numbered, this piece comes with a matching certificate of authenticity. Embrace the dark side — this is one spider you’ll want to keep coming back to admire! Sideshow Collectibles proudly presents the Yoda: Jedi Master Sixth Scale Figure, inspired by his appearance in Star Wars: Episode II Attack of the Clones and Star Wars: Episode III Revenge of the Sith. This highly detailed figure captures Yoda’s familiar expressions with interchangeable head sculpts, and includes Jedi Council and Hover chair accessories to recreate memorable scenes from the Jedi High Council and Jedi Temple. Darth Vader Mythos Polystone Statue by Sideshow Collectibles captures an unprecedented portrayal of the Dark Lord of the Sith’s return to Mustafar. The heat and flames of that volcanic planet steel the resolve of Lord Vader as he considers the rage and loss contained by the fearsome mask in his hand. Three portraits, a younger Anakin, an older Anakin, and the masked version complement an equal number of interchangeable arms that allow the collector to illustrate this tale in a variety of ways. At 21 inches in overall height, the Darth Vader: Dark Contemplations Statue is a most impressive centerpiece for any Star Wars display. The newest entry in the Militaries of Star Wars Sixth Scale figure collection from Sideshow Collectibles is the Snowtrooper. Outfitted to withstand the arctic climate of Hoth, the Snowtrooper Sixth Scale figure features detailed armor, accessories, and weaponry. Add the Snowtrooper to your collection today and watch out for lots more Hoth inspired characters in this line in 2014 and beyond. Last, but not least, why not contribute to the conservation, exhibition, and interpretation of memorabilia and artifacts from Star Wars by supporting the non-profit Rancho Obi-Wan. 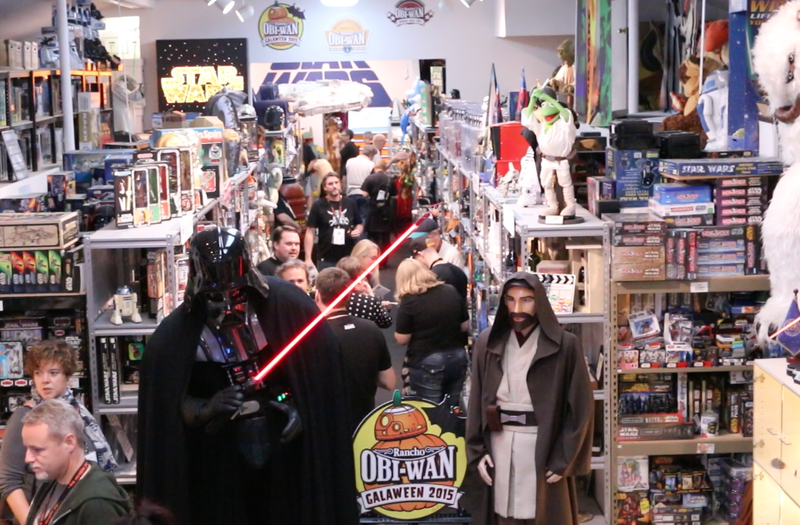 Run by Steve Sansweet, previously Lucasfilm head of fan relations for 16 years, Rancho Obi-Wan was recently inducted into the Guinness World Records for 2014 as being the largest collection of Star Wars items in the world. You can buy annual membership for just $35 or if you’d like to buy something extra special then consider the World Record Night Ultimate Swag Bag (from the Guinness World Record party on November 2). 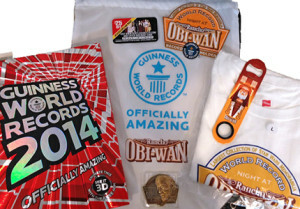 The Swag Bag consists of a Guinness World Records drawstring bag, Guinness World Records 2014 book, T-shirt (in the size of your choice), commemorative Challenge Coin, Patch, Rancho Obi-Wan Bottle Opener, an exclusive $25 discount card from Gentle Giant, 15 exclusive trading cards, and lots more. Bags are limited to just 250 pieces and there are fewer than 40 left at the time of writing at a cost of $250 each. There are many ways to shop — you can visit your local stores, out-of-town shopping areas, or you can take to the Internet. Whichever way you choose, ensure you get a gift receipt just in case the item you buy is already owned by the recipient — if they’re anything like me they’ll be a nightmare to shop for. 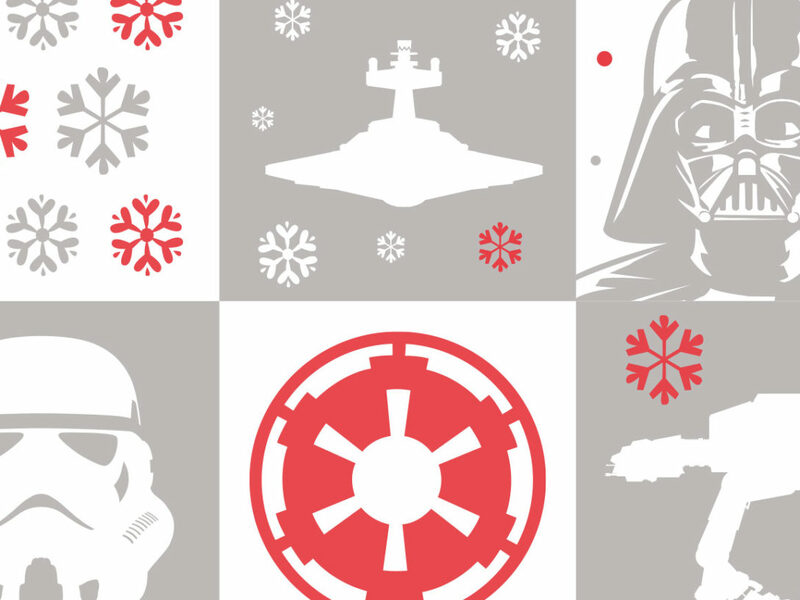 Have a safe, fun holiday season, no matter what… and remember the Force will be with you. Always. 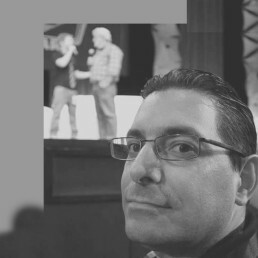 James Burns co-owns and runs Jedi News (with Mark Newbold), the largest English speaking Star Wars fan site in Europe, is the co-host of the UK-centric Radio 1138 podcast and is a regular contributor to the Star Wars Insider. You can also listen to James as part of the monthly Curto Burns Collectors Cast, discussing all the latest Star Wars collecting news with co-host Dan Curto and featuring fellow StarWars.com blogger Steve Sansweet.